We extrapolate a “heaven” from those moments and places of our earthly life, when and where we are most creative, loved and free from anxiety. For some “heaven” is imagined as cedar lodges beside a salmon bearing river. For some it’s a tent site overlooking the ocean or a desert oasis lush with grass for many goats. We imagine reunions and well-being, good work but not toil, relationships without agonizing conflicts. Perhaps in altered consciousness then, all will experience their own dearest envisioning. In the liturgical calendar All Souls used to be known as “The Commemoration of the Faithful Departed”. This November 2nd service (preceded the day before by All Saints) may include hymns featuring thousands of heavenly harpists, radiant raiment and sparkling crowns that never fade. These images, now so worn out and sentimentalized, are easily caricatured. How refreshing then is Tanja Butler’s image of a shaded portico as the New Jerusalem! One’s heart leaps. Can this be true? There is a shock of recognition as if this picture is already stored in ancient memory. Not angels on puffy clouds but real, though not specific, persons inhabit this Middle-Eastern setting. They greet each other, chat, and rest. It brims with animated serenity. What a contrast to the dank underworld imagined in some cultures! Perhaps we could view Tanja Butler’s piece as an icon, a visible depiction of an invisible reality. It’s not so much about promised reward but, especially on All Souls, a trust that our loved “departed” really are in a place that is like unto the setting of this painting. “Like unto” refers to the emotions the picture evokes rather than a verisimilitude of scene. Some years ago in the Diocese of British Columbia, Canada, a priest in an inner city parish was inspired to call the local newspaper to publicize the All Souls service and to invite the community at large. The reporter was receptive and wrote a positive piece. The result? The church was packed that November evening… and not just with the faithful. The service included prayers, chant, silences, Scripture, and a solemn reading of the names of the dead. In the privacy of candlelit darkness, weeping was heard. Who can say how grief and hope intermingled there? It is good to commemorate our lost ones, even though they are not really “lost”. Now to those deep human responses, add this Luminosa, a believably imagined Luminosa. I trust Seamus is there, twinkle-eyed with delighted surprise; the bard not in bleached robes but in his rumpled tweeds. There might be an Irish harp. Tanja Butler: New Jerusalem, 1989, 22,5 x 30 cm, oil on canvas. Tanja Butler was born in Germany in 1955 and moved to the United States as a young girl. She studied art history and studio art and received a graduate degree in painting from the University at Albany, New York. She is interested in the intersection of art and worship. 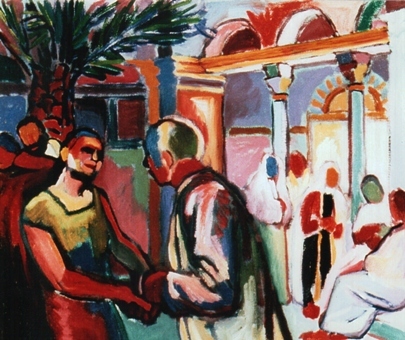 Periods of work in Italy shaped her understanding of ways in which visual art can support the ministry of the church. The frescoes by Fra Angelico in the convent of San Marco in Florence were a particularly influential model. She is an Associate Professor of Art at GordonCollege in Wenham, Massachusetts, where she teaches Painting, Printmaking, Illustration, and Liturgical Art. Students in her classes have created artwork for area churches, schools and community organizations. She enjoys finding ways to create collaborative artwork within the context of community. Her work has been displayed in many solo and group exhibitions across the United States. For more about Tanja Butler and her work, click here and see www.tanjabutler.com. Hannah Main – van der Kamp lives in a remote community on the coast of British Columbia. Her most recent volume of poems, Slow Sunday on the Malaspina Strait, was published by the St Thomas Poetry Series, Toronto, 2012. * Interview with Eleanor Wachtel, Writers and Co/CBC, 2010. ** ‘A Dog was Crying Tonight in Wicklow’, The Spirit Level, 1996.